Solace State is a socially conscious video game. It is a single-player 3D visual novel, where our decisions and political expressions mean the difference between resistance against a despot, or a forced acceptance of injustice and instability. Protagonist Chloe’s hacking and conversations affect other characters’ perception of their society, while her psychological imaginations affect the look of the urban architecture. The player reads the story text embedded into the 3D environment, negotiate and interact with characters, and make choices that impact the game’s final outcome. 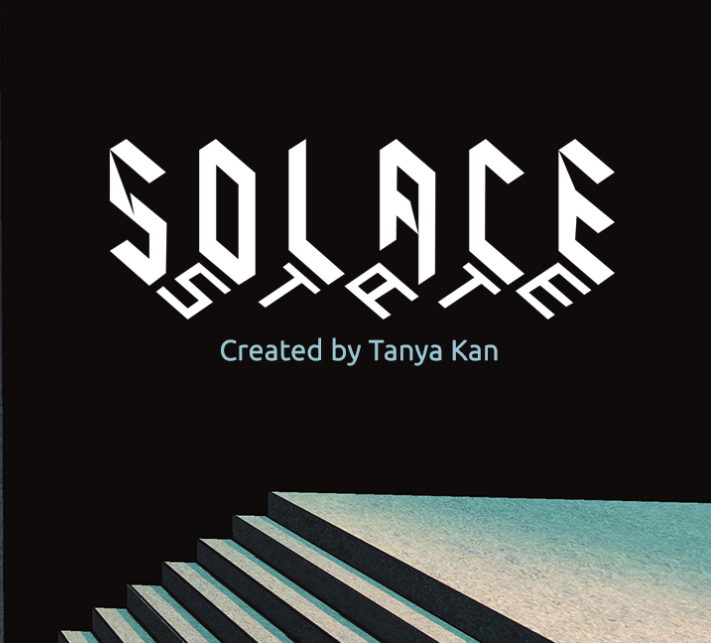 Solace State innovates the visual novel genre by using 3D space as the canvas of its storytelling. By fitting and designing the narrative text onto the surfaces and architecture within a near-future metropolis, Solace State breaks away from dominant hierarchical forms by breaking conventional perspectives and aesthetics in understanding information and history. The player selects choices for Chloe within the 3D environment, and these choices matter in building civil engagement and social cohesion. There are no easy answers in the intertwined, human relationships in building an impactful platform that seeks to minimize exploitation and inequality. Solace State is supported by a backbone of scholarship of political research into marginalized communities. By engaging with activists and politicians abroad, Founder Tanya Kan seeks to have a multicultural and international discourse on how to protect and maintain more equitable, responsive and democratic institutions. She combines this with her interdisciplinary media studies and film studies approach to humanize stories, inspired by these accounts, into interactive media form. Tanya Kan has built Vivid Foundry Corp., a studio that creates original content from ideation to marketplace that currently centres on Solace State’s development. Vivid Foundry focuses on humanizing stories that address social responsibility and civil rights, aimed at empowering youth and adults, and bridging cultures.